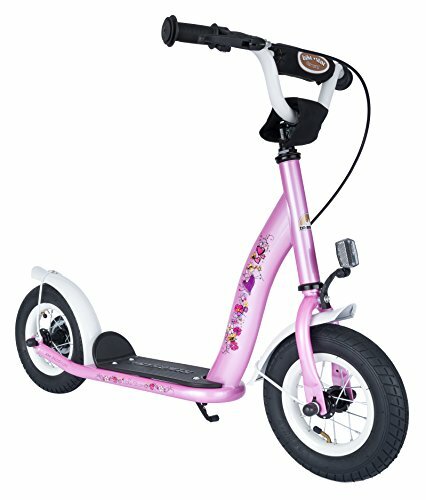 Bikestar 10 inch (25.4 cm) Kids Kick Scooter Pink Fairy Design , selling for $89.99 brand new. Manufactured by Star-Trademarks. There are 1 units left brand new. Classic scooter designed in Germany with modern steel tube framework and eye popping metallic paint finish. 10″ air filled tires on lightweight, high-quality rims. Dont be fooled by foams or plastics. Robust rear brake and skid proof foot board makes for a safe and secure ride. Splash guards/fenders equipped on both wheels. Adjustable break handgrips and hand protection device makes this scooter ideal for a child’s small hands! Bike*star does it again! New to the US market, these eye popping scooters fulfill the highest European and US requirements for quality and safety. This exclusive design will not only delight your child but give you the confidence that they are riding with the latest safety features. Buy with confidence as every bike*star product is backed by a 1 year warranty (original owners) through Dakota Cycle USA. Dakota Cycle is available 7 days a week via our toll free number or email to answer any questions (before or after purchase). Sturdy steel tube framework with impact resistant glitter metallic paint finish. Stylish Fender/spray protection on both wheels. Adjustable handbrake that makes it more suitable for a child’s small hands.